Well well, even for such a busy week must enjoy Sunday right^^ so I pick this movie to watch. 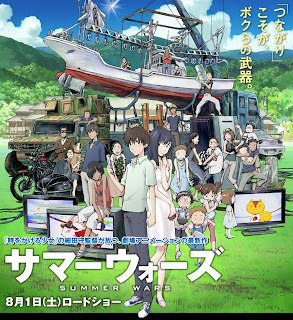 The story centers on high school student Kenji Koiso, a child prodigy in mathematics who spends his time immersed in Oz, a massive computer-simulated virtual reality world. Kenji is a genius with numbers but ill-adept socially. He secretly has a crush on his attractive senpai Natsuki Shinohara but does not have the courage to tell her. At the beginning of summer vacation, he is asked by Natsuki to help in celebrating her great-grandmother's 90th birthday. Although Kenji does not know the details of the plan, he agrees and goes with Natsuki to her grandmother's estate in Ueda, Nagano Prefecture. Much to Kenji's surprise, he is introduced at the Shinohara family house as Natsuki's boyfriend. As Kenji tries to act the part, meets Natsuki's dozens of relatives, he receives a mysterious e-mail with a mathematics code. He cracks the code and returns it to the sender but finds himself at the center of a developing news story the following day. Overnight, Oz has been hacked and turned into a digital deadzone, and he is the prime suspect. Using Kenji's account and avatar, the real "hacker", which is actually the advanced artificial intelligence system call Love Machine, has stripped the virtual world empty and wreaks havoc in the real world. With car navigation systems disabled and computers malfunctioning, Japan grinds to a halt. Love Machine also gains control of a satellite and threatens to send it crashing to Earth. In order to fight back, Kenji enlists the help of Natsuki's family, and his best friend using an army of avatars. With the fate of the world at stake, a great online summer war takes place.